The Sven Co-op Development Team is incredibly proud to announce that we are now focusing all of our effort on our next big project. We've been granted access by Valve to work on our own custom version of the Half-Life engine! After nearly fifteen years in development as a mod for Half-Life, and with our final mod release out of the way, the Sven Co-op Development Team is incredibly proud to announce that we are now focusing all of our effort on our next big project. We've been granted access by Valve to work on our own custom version of the Half-Life engine! The majority of readers are probably asking themselves, “As an alpaca rancher, why is this showing up in my search results?”, a question for which there is no easy answer. We are grateful beyond expression to Valve for their generosity and efforts put forth to make this possible. We’re looking forward to working with one of the greatest game engines ever made, and we can assure everyone that there are many, many more updates to come. More news and progress updates will be posted in the near future, so keep a lookout. I like it a lot. This is good news, however, I'm not a fan of free Half-Life campaign. Anyway, good luck! Waiting for more news! Well if I want to experience almost all campaing of HL1 as today, I would choose Black Mesa as right now is playable totally free of charge. This said I suppose the HL1 content will require having hl1 files, as garry's mod need the other games content to use things made with them. Let's wait for official responses so they clarify all this ^^. Any reason in particular why? An explanation is always nice if you want to validate your opinion. The devs say they are working on a custom version of GoldSrc engine (HL1). That's absolutely awesome, because they are actually improving a +10 year old engine. Better gameplay, better graphics. Everything will be better. 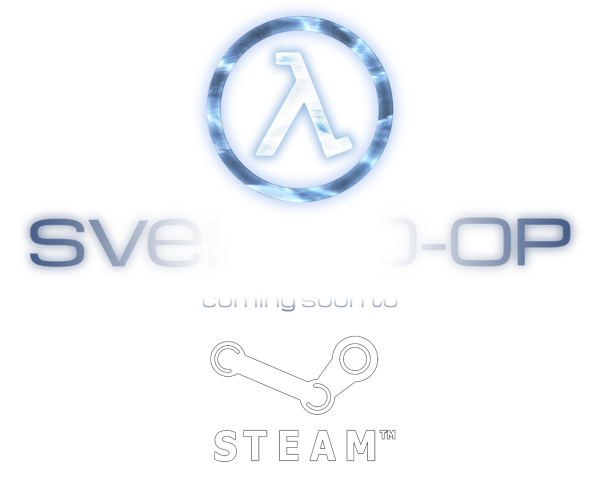 Sven-Coop is famous for it's coop experience, offering support to play HL1 and it's addons with friends, alongside all the community made campaigns and maps. Thing is, they say that the HL1 campaign will be in the game itself and you don't need to own it, making HL1 a totally FREE game, as the Sven-Coop game will be free. You could just download Sven-Coop and play HL1 alone for free, and I think that is wrong. One thing is playing Black Mesa HL2 mod, which is a complete re-imagination of HL1, built from the ground up in the Source Engine. Other thing is picking up an entire, give it a few tweaks so it could be functional in cooperative gameplay. I could accept this "free" HL1 if they actually change it. Create maps from the ground up, whatever. Make them more modern and pretty, making good use of their custom engine. These are my motives. This is my opinion. The Half-Life 1 campaign will be co-op only. A single player will not be able to play through it without multiple players. Right, that thing with two players pressing two buttons at the same. Anyway, I would most pleased with this free HL1 game if the dev team added puzzles that actually require both players to work in sync and together, plus the things I mentioned above: the rebuilt maps and others. This Sven-Coop game has a lot of potential, and I wouldn't mind in any way to pay for this. All I want is it to reach it's full potential. Nice assumption, but that's not how we're going to force cooperative gameplay. More details will be posted later, once we make a reasonable amount of progress. "You could just download Sven-Coop and play HL1 alone for free, and I think that is wrong." That's not YOUR problem though, it's valves, and they are perfectly aware of that and they allow it to top it. Don't be so self righteous for things that don't even concern you. I already said I was wrong. You need two players at least to be able to start a coop HL1 playthrough. And you're absolutely right, it's none of my business how Valve deals with their own games. It's theirs. If they want everyone to play their game for FREE, then the community should be happy, including me, because it is an absolute masterpiece. They could even make like Bethesda did with the old TES games. Make the HL1 and the addons free. That would attract some more people to the series and it would be a joy for everyone that just could not play it for some reason. I'm sorry to have been against this free HL1 thing. Everyone deserves to play this masterpiece. "This Sven-Coop game has a lot of potential" <- are you serious? Sven-Coop is one of the oldest mods every made for HL1! After they have put so much work into this and all the content that is included with it I couldn't imagine anyone more fit to do this free HL1 coop re-release with Valve's blessing. I recognize you apologized, but I still wanted to add this. Valve did a very generous thing at the time when they buried WON and released Steam. If you happened to own Half-Life before the switch, you were automatically granted every expansion pack (Opposing Force, Blue Shift, commercial versions of Counter-Strike & Day Of Defeat). So it's safe to assume, they kind of gave up profiting from GoldSrc-based games probably because of the future with Steam and Source-based games. This is pretty interesting! Cannot wait for this! As this could make what TF2 did to source, making the engine free so all the mods for hl1 that still being in development (as ESF, for example) will be free for everyone. Second, will this new/updated engine be retro-compatible with older mods?, or will it break them? If not (break), then something I have been praying for is finally getting on our hands. Anyway, and last but not least, congratz for what you got, I can't wait to finally see "real" upgrades to the great engine know as GldSrc. You will make history :). Nuff said :P, and again good luck ^^. so it will have all the half-life 1 series together when it becomes a game? I do wonder what improvements you'll make. My main hope is that the game will allow for proper scaling based on player count, as well as some system to stop "spawn rush die" gameplay. I really hope you can change how level transition work. Things that are annoying me is that ammo, health and armor resets every time you load new map, and items always respawn. Well last time i played sven coop was 3.0 version, so i don't know if that has been changed already. We're actually working on this now. If that's possible, does that mean it would also be possible to have other client side persistence? Specifically, a client side, official version of that old server mod for SC v3 that allowed you to level up health and armour. The main problem from what I could tell, as well as resetting your level every time you switched server, it was also imbalanced to the point of being broken. Gravity jump and infinite MP5 grenades in particular. A balanced, properly integrated version could be amazing. Not what I am expecting for a big news, I thought you're going to continue on Sven Coop 2. Will we see the next chapter with Chummy? Haha! I was in on the IRC Chat. Freaking hilarious. SVEN is actually relatively hard and there are a lot of changes in the placement of the enemies in the game. Sure you get the campaign itself free, but you don't get the original placements and whatnots. This can be good or bad depending on your viewpoint of Half-Life. I am indifferent to this as I love Sven and Half-Life. As JPolito mentions, the HL co-op campaign will require 2+ players. Note that it's Valve who are letting us include the HL1 maps, though... I'm not sure that there's anything too bad about Valve generously giving everyone something for free. In fact, it seems to me to be a good thing. as a world famous alpaca rancher i am really suspicous about his "FREE for all Steam users"
The catch is that you need use steam. You say that like they're gonna sneak out 10 bucks out of your bank account every time you play the hl1 campaign. One quick question for the developers of SC. Will this standalone title be far more stable than the current Half-Life (unstable due to the linux update on steam)? this is a killing news .. its a killing by laughing . by the way , too many people of the sc community needs it to earn money , by now directly licking from valve"$ brain , hmmmm. sc did nothing on that , its "own" engine being full of bug mostly with sc3 and after ..
by now past can not be changed , sc team , should ask for hl3 engine instead and valve should publish source of hl like id did . When it comes to the financial stands of a business, every game could be seeking a profit in some ways. If people expect developers to be noble willing to do everything without some kind of benefit, you're sadly mistaking here. Where it be a fanbase, experience or money, it's all benefits that human beings require. With this thought, why was it that when Cry of Fear got pushed as a standalone title, no one complained? It makes no difference whether a mod becomes a game or not. If the developers remain onto trying to create new content, it satisfies the players and the developers profit from it. If anything, the low player activity is due to the update of Half-Life itself. The bugs come from the current linux update for Half-Life, causing major rendering, loading, framerate and other problems within the game. Valve has already released the tools needed to mod all their game, that's enough. People also tend to make games based off of the Source engine, nothing new here. If anything, instead of looking onto developers as people who don't have financial requirements themselves, think of the problem when it comes to money. The Sven co-op website for instance. In order to keep that up you need to pay for the host itself. Advertisement money tends to be very low and not that profitable so the developers try and rely on a donators system to help out with the bills. If anything, I feel like this focus was more onto to try and get everyone onto a F2P experience with Sven just like with TF2. The game itself will most likely be available to everyone but there will be premium features for the players themselves. This will also bring more people onto steam, people that just don't have the money to afford any games. All in all, I find these news more positive than negative. And I'm glad that Sven co-op didn't end up being another old mod going on without any updates. If Counter-Strike can still keep going even to this day, than why can't Sven co-op either? Why don't you go **** yourself you *******. Harsh words from candy/rainbow/whateverthefuckpony land. I would have been willing to pay for the new version of Sven Coop. This is good news though. congrats guys, couldn't come to a more deserving team. you guys are older than moddb! Amazing news! Any clue on whats in store for the first release? Although improved graphics would be nice, I hope you continue to focus on expanding gameplay at first. I play sven coop for the fun coop action, not for pretty visuals. We'll be focusing on updating the gameplay for the initial Steam release. Workshop anyone? custom maps through workshop? That could be great, but i don't think Valve will approve this. Still Sven Coop maps database is sill functional though. This is a good idea. But you know Valve, they probably won't do it. Good news ! Now back to my alpacas. just a question does sc4.8 has some mapcycle having 220 maps in a row without crashing...? sven viking , the hijacked that should not even have a pant left in sc... shouls know that i am ready to discuss BUT SOME HEADS HAVE TO BE : guillotined AND FEW OTHERS BANNED according to what some did and wrote at that time . If you want to prove something, at least do it without using anger. Proper official complaints require a respective neutral form. Whatever kind of problems you might have with the developers, that should not prevent them from continuing on their project. If you can't do anything about your problems with the developers, try to move on. by the way like i wrote , i made they hunger coop and spent a lot of energy to help for it to be done . for they hunger coop , it is a very old project from the day sc 3 was out...more than 10 years... the game still plays very well from the day it was published. but it seems to be impossible for the sc team to create it coop despite they have the files to compile the maps...engine trouble...? by the way , this news that should have been posted by s.vicky or s.vicking ? and it needs an official one from steam too to be validated. I would just like to clear something up. While sixcentgeorge did work on THC for a while, all of his work was scrapped. This was due to him ripenting the original Black Widow maps when we had access to the original source .rmf files and had worked on them for years. In addition, George's version of THC did not fit our vision of the campaign, due to george integrating new enemies into the maps that did not belong, such as stormtroopers, zulu warriors, dinosaurs, arachnids from starship troopers, among many other bizarre things, which for obvious reasons did not contribute to the original b-movie zombie horror feel of they hunger. After the team discovered what he was working on, he was subsequently removed from the development team for various reasons. He then released his own version of THC on the forum, which turned out to contain an abundance of crashes and model errors, after which he was banned for leaking development files, and he has harbored a grudge ever since. Hope this clears things up. after 5 years of no-work AT ALL by these specialist$ of "when done" , a work of 2 weeks is not GOOD at all . i never released it in sc forum or show links to the topic. WHAT CLEARS EVERY THING : is that you still not made it..
and that the carrot with they hunger 2 is true . I'll look into this carrot thing, sounds delicious. i wonder if it will survive ...it is not sc forum , they should have not done the same as sc forum . i am sure they will like : the carrot of "theyhunger2 + sc 3.x"
that is for asking about sniper 's being a gay that made be banned ... that should be kept secret.